OTTAWA – The puck was in the back of the net before the Buffalo Sabres realized what had just occurred. Ottawa Senators winger Brian Gibbons snuck behind a group of defenders and one-timed a pass from Christian Jaros into the back of the net for a two-goal lead inside Canadian Tire Centre on Tuesday night. 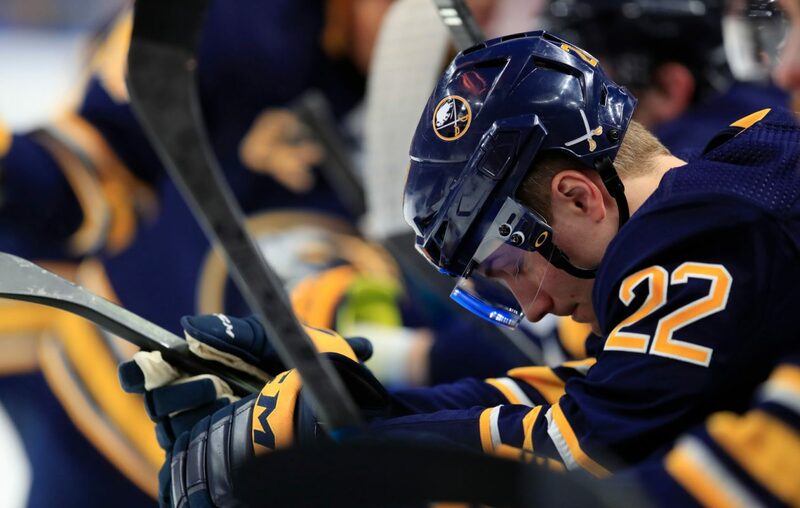 The sequence was a microcosm of all that has gone wrong for the Sabres since they were atop the NHL standings Nov. 28, and it resulted in them reaching another historic low. With a 4-0 road loss to the Senators, Buffalo became the first team since the 2003-04 Chicago Blackhawks to drop 13 consecutive road games and have a league-worst 35 points since their 10-game winning streak. The Sabres (31-36-9) remain 12th in the Eastern Conference and, along with the New York Rangers, have the fifth-fewest points in the NHL. Ottawa (27-43-6), the league's most dysfunctional franchise, had recently endured a stretch in which it lost 18 of 22 games. It traded its two best players last month and fired former coach Guy Boucher on March 1. Still, the Senators picked apart the Sabres' defensive coverage. Gibbons, Anthony Duclair, Rudolfs Balcers and Magnus Paajarvi scored goals, the latter two coming 90 seconds apart in the third period. Carter Hutton made 26 saves, while Buffalo was shut out for the fourth time in nine games. The Sabres have lost 17 of their last 20 games, including 11 of their last 12. Opening salvo: Duclair gave the Senators a 1-0 lead, when he buried a rebound off Oscar Lindberg's shot with 2:53 remaining in the first period. Though Marco Scandella challenged Lindberg, no one was there to cover Duclair, who was standing to Hutton's right. Another one: The lead got pushed to 2-0 with 11 seconds left in the first period, when Gibbons one-timed a back-door shot pass from Jaros into the open net. Entering the game, the Senators had a negative-12 goal differential in the first period this season, compared to the Sabres' mark of plus-9. Ugly first: The Sabres were outshot, 16-8, after having the game's first five shots on goal, though they generated two more scoring chances, according to NaturalStatTrick.com. First timer: Defenseman Will Borgen, who was recalled from Rochester because Rasmus Ristolainen felt ill, made his NHL debut. The 22-year-old had two goals and 10 assists in 66 games with the Amerks. He was drafted in the fourth round in 2015. Close call: The Sabres had more shots (9-7) and shot attempts (24-16) in the second period, yet they trailed 2-0 after 40 minutes. Their best scoring chance occurred when Sam Reinhart was stopped by Craig Anderson during a 2-on-1 odd-man rush. Big hit: Sabres center Evan Rodrigues exited the game with 4:14 left in the second period after he was drilled into the boards by Ottawa defenseman Mark Borowiecki, who was penalized on the play. Rodrigues returned for the third period. Another shake: That sluggish first period led coach Phil Housley to reunite Reinhart with Jack Eichel and Jeff Skinner on the first line, while Conor Sheary was moved down to the fourth line. Additionally, Casey Mittelstadt skated with Alex Nylander and Zemgus Girgensons. Relevant stats: The Sabres were 6-2-2 in their previous 10 meetings against the Senators and led the all-time series 68-51-20. Ottawa was 16-4-2 when leading after two periods, while Buffalo was 7-27-2 when trailing after 40 minutes. Lineup: In addition to Ristolainen, defensemen Zach Bogosian (lower body) and Matt Hunwick (upper body) were not available to play for the Sabres. Forwards Scott Wilson and Vladimir Sobotka were healthy scratches. Next: The Sabres are scheduled to be off Wednesday and will hold a morning skate Thursday in preparation to play the Detroit Red Wings in KeyBank Center.